The 2019 Major League Baseball season is here and now 30 teams will play 162 games apiece to see which two teams will advance to the World Series in October - and you can find out how to live stream MLB action here. Last season, the Boston Red Sox faced off against the Los Angeles Dodgers in the 114th edition of the World Series. This was the second time in MLB history that both franchises met at the World Series and just as they did in 1916, the Red Sox defeated the Dodgers by winning four out of seven games. The year’s MLB regular season began on March 20 and it will run until September 29 at which point the postseason will begin on October 1. So that promises the prospect of enjoying six whole months of baseball with a game to watch almost every single day. That's why TechRadar has put together this handy MLB live stream guide. Whether you’re a fan of the New York Yankees, Boston Red Sox, Chicago Cubs, Houston Astros or any of the other teams in the league, we’ll help you find a way to watch your favorite franchise play whether that be on your television, streaming devices or even on your smartphone. Keep reading and we’ll show you exactly how to live stream MLB from anywhere in the world so that you don’t miss a single pitch this season. If you’re a die hard baseball fan, then you’ve probably heard of MLB.TV, the MLB’s own streaming service that lets you follow your favorite team, or even multiple teams, all season from spring training all the way to the postseason. The service has the most extensive game coverage and supports all of your favorite streaming devices as well. With MLB.TV you can watch every out-of-market regular season game live or on demand in HD. While you can pay monthly, the service’s out-of-market yearly packages offer the best value and you can choose to follow a single team for $92 or all of the teams in the league for $119. You won’t miss a second of the action either as every game is streamed at 60fps and there are even multiple audio options available including Spanish language commentary, the home or away team’s radio broadcast and even the ballpark’s natural sounds. MLB.TV also supports all of the most popular streaming devices including Apple TV, Chromecast, Amazon Fire TV, Xbox One, Playstation 4 and Android and iOS so you’ll never miss a game no matter where you are. If you already pay for a cable subscription, then you might as well put it to use to watch some baseball. However, you will likely be changing the channel quite a lot as the network showing each game will depend on which day of the week it is. Games that take place on Sunday afternoon will be shown on TBS while games that take place on Sunday night will be shown on ESPN, Monday, Tuesday and Wednesday night games will be shown on ESPN, Thursday night games will be shown on the MLB Network, Saturday afternoon games will be shown on Fox and Fox Sports 1 and Saturday night games will be shown on Fox. Got all that, but would rather know your options for watching MLB online via a sports streaming service as a cord cutter? Keep scrolling down, to discover your choices. If you’re a big fan of your home team and don’t want to pay for local cable television just to watch some baseball, catching them play live is made very difficult for you. Since the MLB agrees to exclusive rights for those stations, MLB.TV can’t show live streams of games as they’re broadcast locally. Instead, you have to settle to watch the game 90 minutes after it ends. However, using a VPN is a handy and legal way around this. Once you’ve signed up for a MLB subscription, grab one of our recommended options and log in. Then you can use a server in another state to watch your home team play live even during MLB blackouts. But remember that the same applies if you're trying to watch the your home team play locally during a blackout game - you'll need a VPN to do so, so check out how to do that above. ESPN+ is offering fans a dynamic lineup of live sports, high-quality original shows and films, exclusive studio programs and an unmatched on-demand library. And it's really cheap, costing only $4.99 per month. When it comes to MLB, ESPN+ features one MLB game each day, seven days per week throughout the MLB regular season. That means it won't necessarily be the most comprehensive option for baseball fans. But if you’re interested in following the MLB as a whole and want to catch up with other big games, than this service could be a good fit. And possibly the best news is that you can try ESPN+ with its 7-day FREE trial. PlayStation Vue $45 - With Playstation Vue’s Access plan you’ll be able to watch ESPN, ESPN2, Fox, FS1 and TBS. While this plan doesn’t include the MLB network, Sony’s Core plan does for just $5 more at $50 per month. 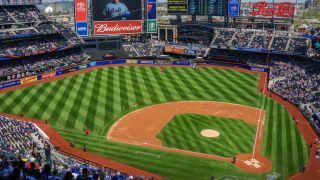 Sling TV $25 or $40 - Sling TV is an inexpensive way to watch baseball though you’ll be missing out on games shown on the MLB Network. The service splits its content into two different TV packages which does make things cheaper though to stream MLB you’ll need to sign up for both. Sling TV is compatible with Apple TV, Roku, Xbox One, Chromecast as well as lots of other devices and its easy to get started with a 7-day free trial. Hulu with Live TV $45 - Hulu with live TV includes ESPN, ESPN2, Fox, FS1 and TBS but does not come with the MLB Network. fuboTV $19.99 for the first month - fuboTV has a low introductory price though after that the price goes up to $44.99 a month and includes 70 channels. Unfortunately it does not have ESPN, MLB Network or TBS though it does offer strong local coverage and 30 hours of cloud DVR storage. fuboTV does has a free 7-day trial available so you can test out its functionality for yourself. YouTube TV $40 per month - YouTube TV includes ESPN, ESPN2, Fox, FS1, MLB Network and TBS. Google’s service includes all of the networks that carry national baseball broadcasts though you’ll have to check out its welcome page to see which local networks and regional sports networks are available in your area. UK baseball fans will be able to watch this season’s games on BT Sport which is included in BT’s TV bundles. If you aren’t a BT Sport subscriber, you can sign up for the BT Sport app for £10 a month with the first three months free or subscribe via Sky TV or TalkTalk TV for £29.99 a month. If BT Sport’s monthly prices are too high for you, remember that MLB.TV is also available in the UK. If you’re looking to watch the Toronto Blue Jays or even your favorite US baseball team, there are a number of ways to watch MLB in Canada. Baseball fans with a cable subscription will be able to watch games on Sportsnet, TVA Sports, TSN and RDS. Don’t want to pay for a premium cable subscription just to watch baseball, don’t worry as MLB.TV is available in Canada (with no blackouts). You can also watch MLB on DAZN via the MLB Network which will feature at least one live game every day.